• We have the New MoonLight 2+ in stock now. • Just got the MLL UL2 wind test results. Take a look and remember that most people over estimate wind speed by almost a factor of two — these tents are STRONG!More wind discussion here. Photo above: MoonLight 2 on the Left, MoonLight 4+ on the right. 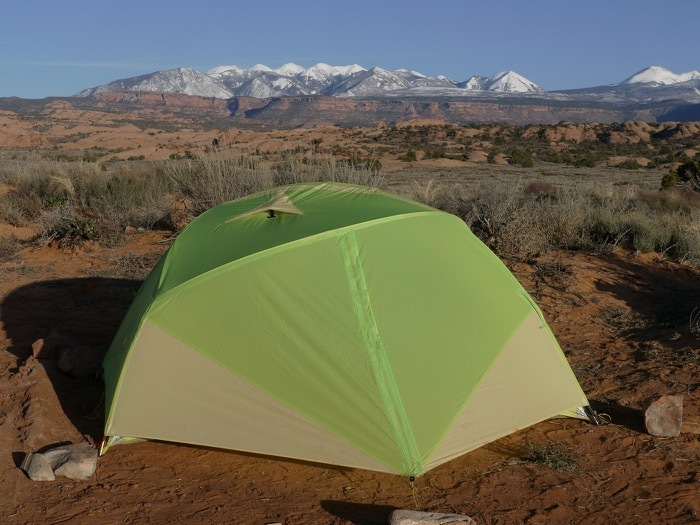 I've made a LOT of tents so let me give you the 20-second breakdown on these: these are the biggest, strongest and nicest to use backpacking tents around. 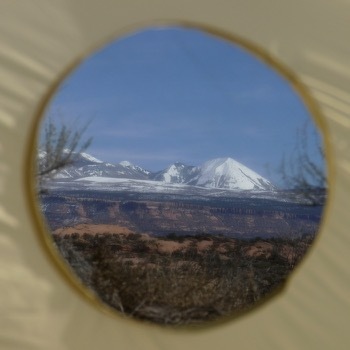 They are focused on contributing to your trip as much as a tent possibly can. 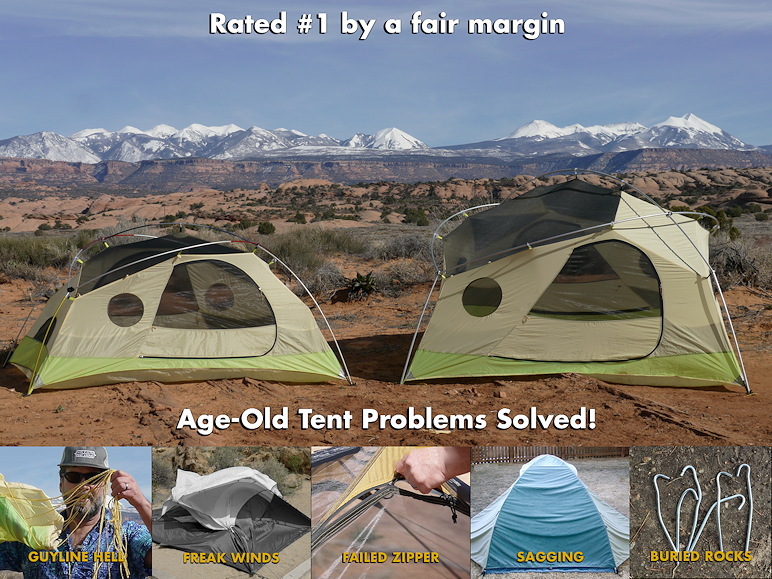 They are not the absolute lightest tents you can buy, but they’re no slouches either. 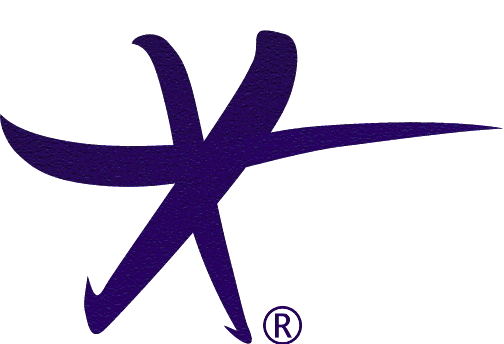 Their 20D fabrics (and 30D floors) are delightfully lightweight and compressible. I’ve designed the MoonLights to be wonderful to use in every way. 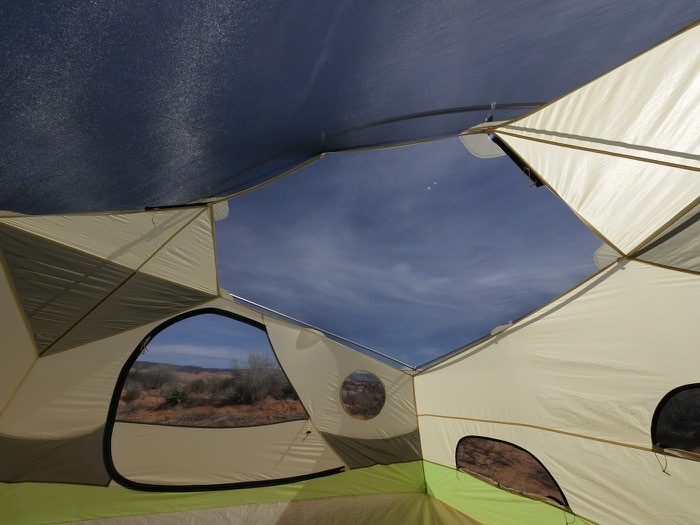 They have features to help you enjoy your time in the outdoors that you won't find on any other tents. I designed them as I personally would want them and how I would recommend them to friends. Think of them as coming from a grumpy old designer perspective where "mostly works OK" just doesn't cut it anymore. I want my tent to work really well every time and in almost every condition. The number of FUNCTIONAL improvements I've made in these tents is actually kind of amazing. I doubt that anyone had any idea that there was so much room for improved USEFULNESS over regular tents. These tents are truly beyond state-of-the-art. You may not have noticed, but backpacking tents have been relentlessly driven to lower weight and price no matter what it takes. 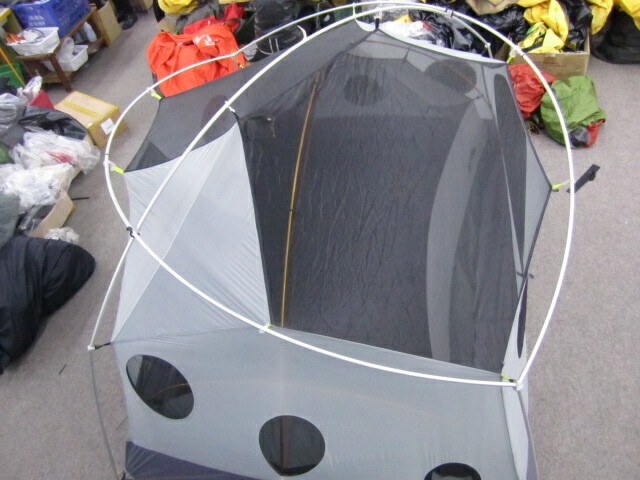 As a result, most tents have been clean-stripped of features; even good ones that really help basic usability. These tents come at it the other way. I started with a roomy and strong EyePole architecture, executed it in 20D (D-denier) class fabrics, and then carefully added back some very lightweight features that let you confidently camp in more spectacular places, make your life easier, and even help you get some sleep by being quieter and worry-free. 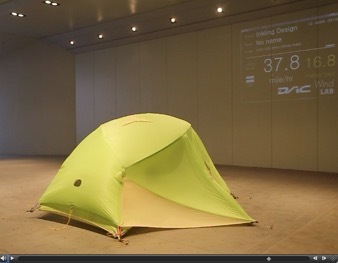 Imagine that – tents actually designed to help you sleep. Why is that not at the top of every list? Go figure. We also seem to have hit a nerve with our no-FR chemicals policy. We take the trust shown by our customers very seriously and have expanded on it by getting rid of all fluorinated DWR treatments (only silicone allowed). I’m pretty sure that some of the ideas discussed here will offer an "Aha!" moment or two. As I’ve said, my goal was to make these tents just plain wonderful to use. That covers a LOT of ground: super easy to setup and anchor, needing no midnight adjustments no matter what weather comes — no be a pleasure to be in and an enabling piece of gear for enjoyable trips in spectacular and exposed, sites. 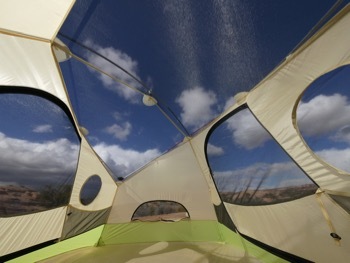 I wanted the tent to eliminate the whole idea of a stormed-out trip. Crucial to fulfilling that goal was the development of the idea of Set-It-and-Forget-It; the idea that a tent could be so solid performing and reliable that you could just set it up - quickly and easily overcoming any obstacles - and then not have to touch it until it was time to leave. No fiddle-faddling, no cord gerry-mandering, no getting out in the middle of the night to fix something. What would it take to make a tent REALLY do THAT? As it turned out it needed to be a quite different tent under the hood. One that goes against some really big norms: NO nylon fabrics, and NOT stripped-for-weight are the two biggest. As you read this you will see Set-It-and-Forget-It peeking out from behind feature after feature. It is achieved in these tents. 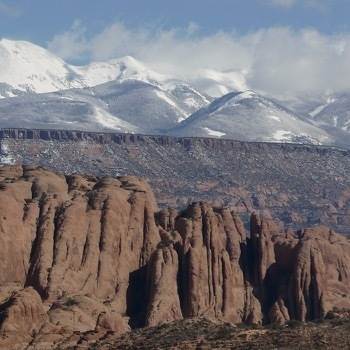 Scenery - a huge part of any great trip. If a stake can go in anywhere in the pie-shape below, the MoonLight can use it! Or it can use rocks fast and easily. 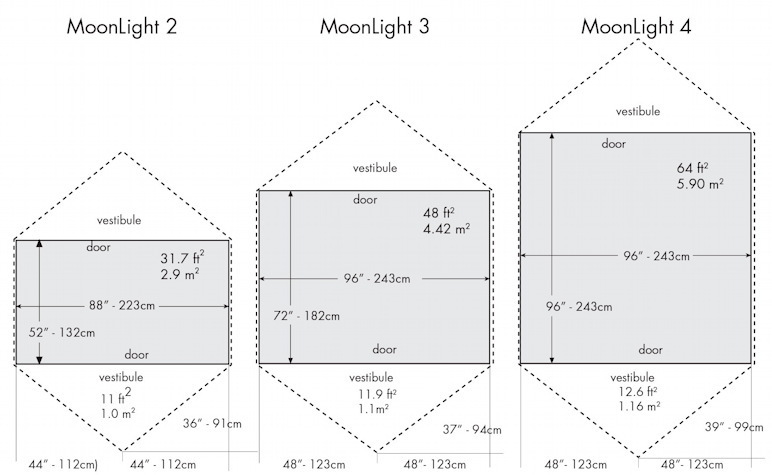 Why yes, that’s a three person ultralight tent pitched inside a MoonLight3+. Thanks for asking! Pitched solidly even though only one stake would go in. 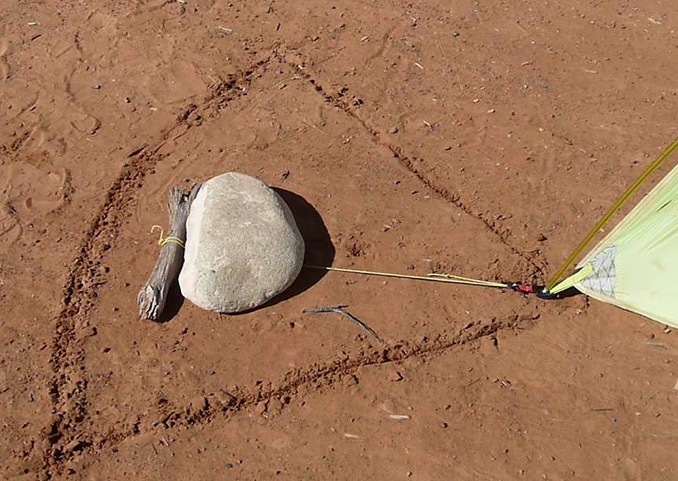 5 out of 6 anchors are rock piles - all done as easy as pie. the MoonLight 4’s expansive and lovely interior. Very relaxing, very outward-looking.